Often, when Keith asks me what I’ve been up to, my response is, “Puttering.” That is my word for little errands. I have a tough time sitting still. That is why, when my friend introduced me to knitting, I felt like I had found the perfect indoor hobby for me (see her web page here – great resource for all things knitting as well as a fun hub for blogs she likes – The Daisy Patch has made it to this esteemed list!) But, this post isn’t about knitting. I woke up yesterday morning at around 7 and set about Puttering. I donned the new mucks, went to the basement, checked on everything. Sadly, the Edamame does NOT look good. I think it missed a day of watering. So, I decided to plant some more seeds. 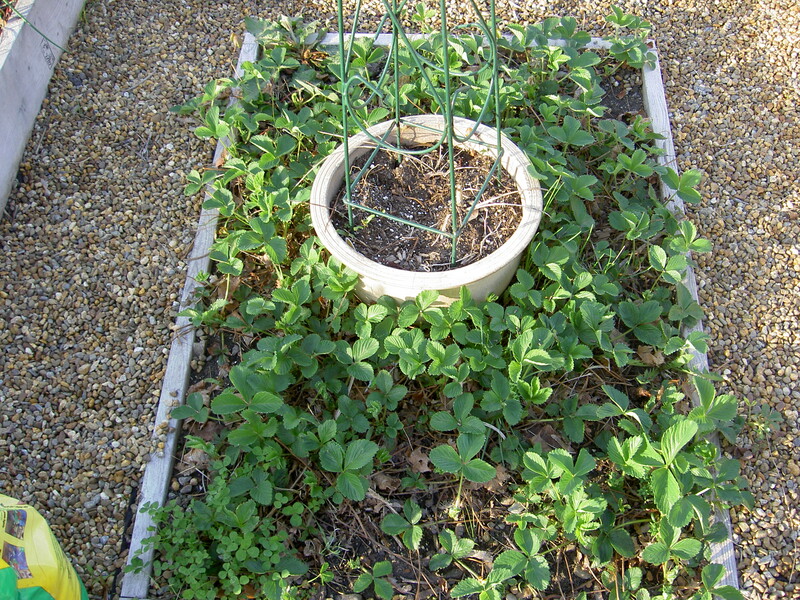 I planted more Edamame, beans and some flowers. I watered the plants in the basement and then brought them outside to harden off on the eastern side of the house. Hardening off gradually exposes seedlings to the elements to toughen them up a bit – wind, sun, rain, temperature fluctuations. On the eastern side of the house, they were exposed to a breeze and the warm morning sun, then, as the sun moved, it would get a little cooler. Good conditions. I planted more lettuce, mache, arugula and spinach seeds in the Cook’s Garden (new name for the Side Garden/Kitchen Garden/Peber’s Point). These little guys are three weeks old. Succession planting is important because we’ll constantly have seedlings coming up and plants growing to replace the ones we harvest. As I’ve mentioned before, I have been dreaming of fresh lettuces from the garden and am going to town on planting a lot of salad greens. 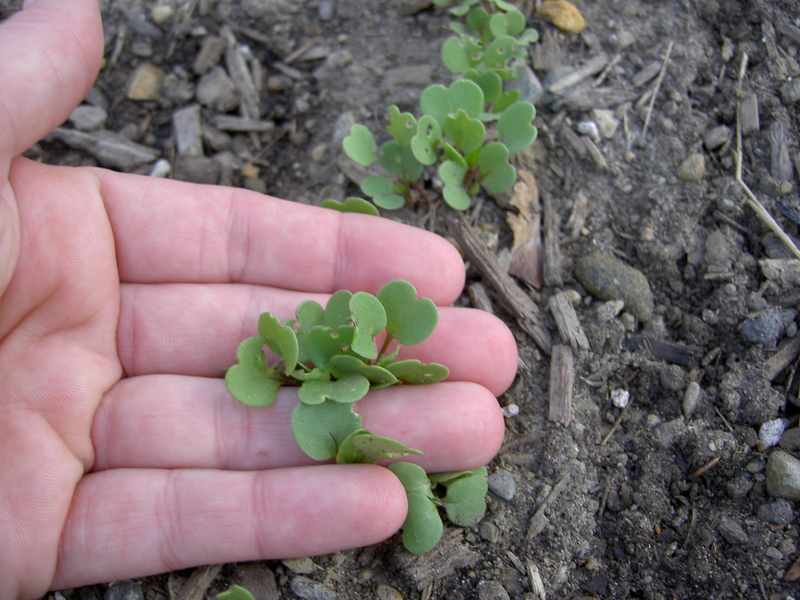 You might recall from Togethergoal, the tray of Arugula microgreens failed, so we didn’t have a chance to try them. I tried it yesterday. Yummy! Nice and peppery. Keith is going to make some Beef Carpaccio tonight and we’ll put some microgreens on it. I think that’ll be really good. I read about Drunken Woman lettuce in the seed catalog. We have loved every red speckled lettuce variety we’ve tried so I decided to order some. Besides, the name itself belongs in our garden. 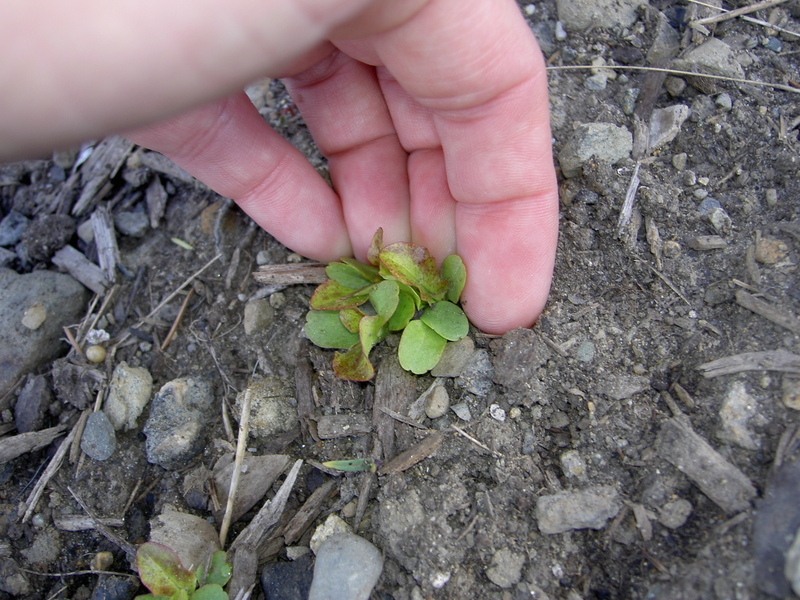 Here’s a link to someone’s blog describing this lettuce. I thought it was a nice post and the picture is great. Now that I see it in full splendor – 1) Yay! I can’t wait! and 2) Crap, I’ll have to thin it. 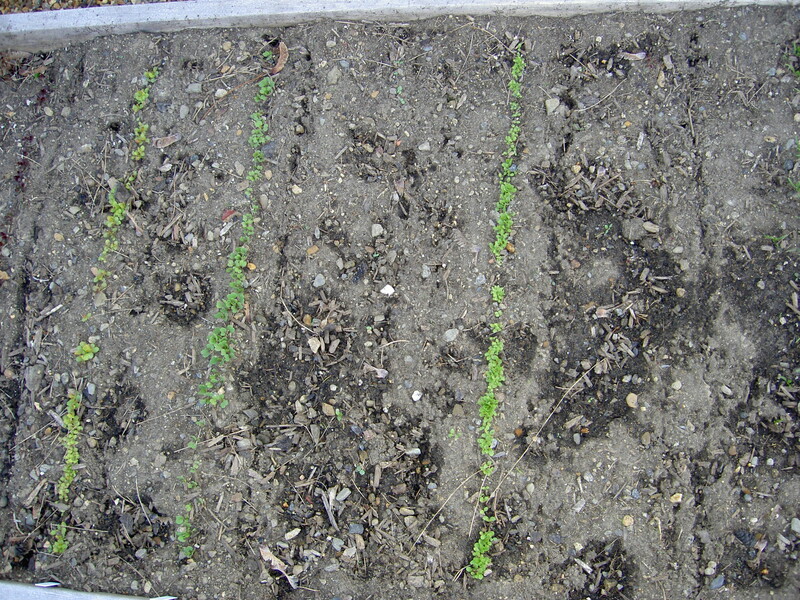 That’s ok, lettuce seedlings are great in a salad. What else did I do during my puttering? 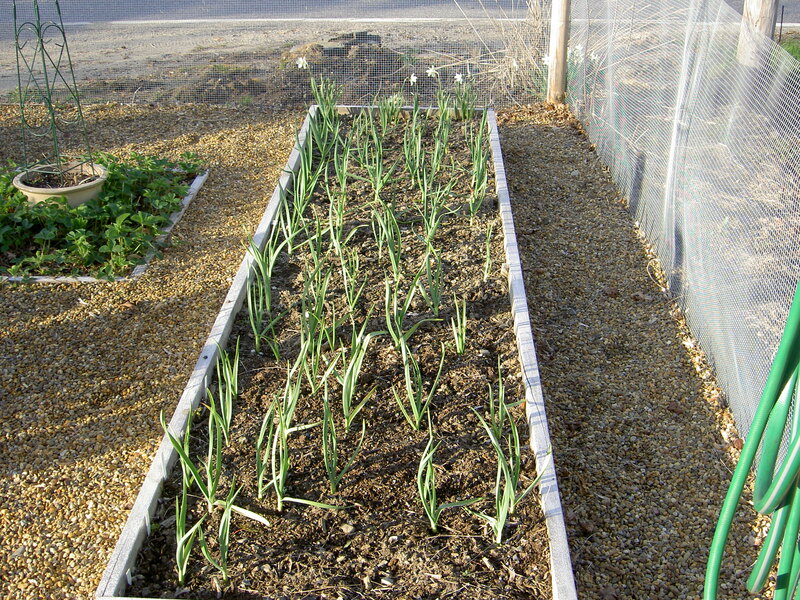 I watered the garlic. We ordered 3 different varieties of garlic last Fall and I took up the entire 12’x3′ bed in the Cook’s Garden to plant them. They look great. I can’t wait until we get scapes. Garlic Scapes are the shoot of a hard neck garlic variety. Here’s a better description and a small ode to the scape. The scapes end up in the saute pan or in pesto. Yumzy. Small concern – I have no idea if these are the varieties that send up scapes. We shall see. I hope so. Back to the putter session. I weeded our small strawberry patch. I put flowers in that pot last year and just decided this Spring to add the trellis. I think I’ll put a flowering climbing plant on it for some color. 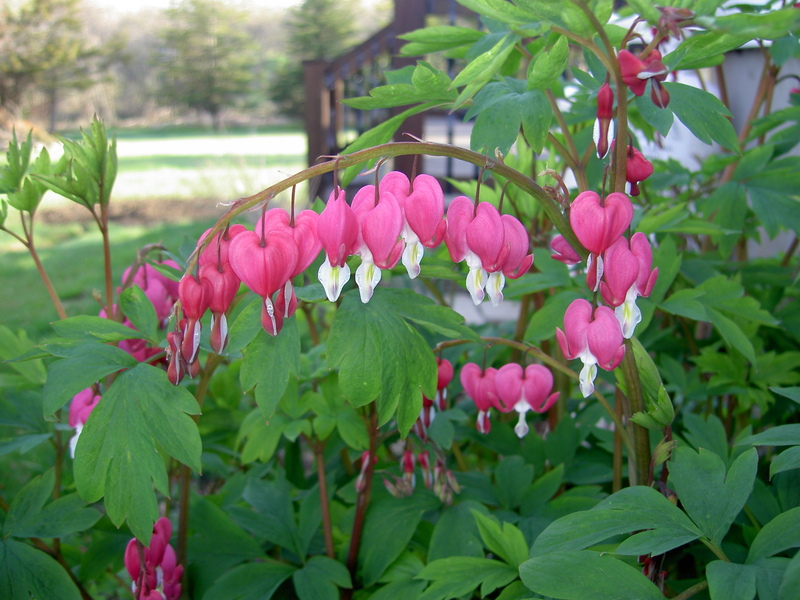 Gardener followers of the Patch – if you have any ideas, do share. Nasturtium? I also visited our flowers. 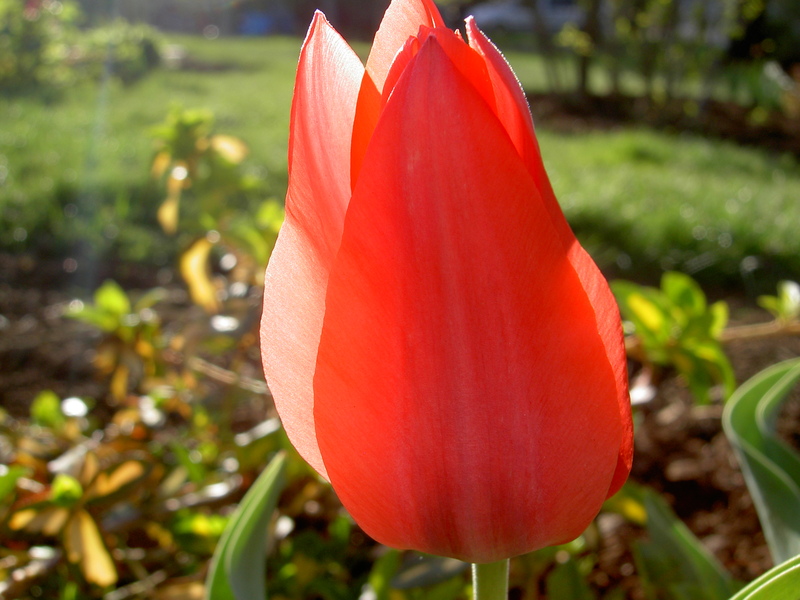 At the beginning of this post, I put some pictures of dwarf early tulips in the sun. 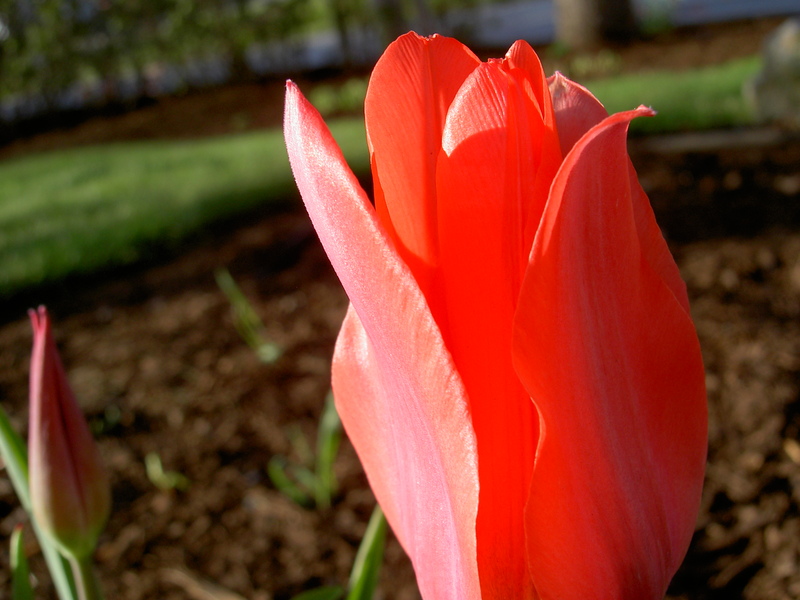 This color is so different – it isn’t orange or peach, it is this wonderful translucent tangerine. 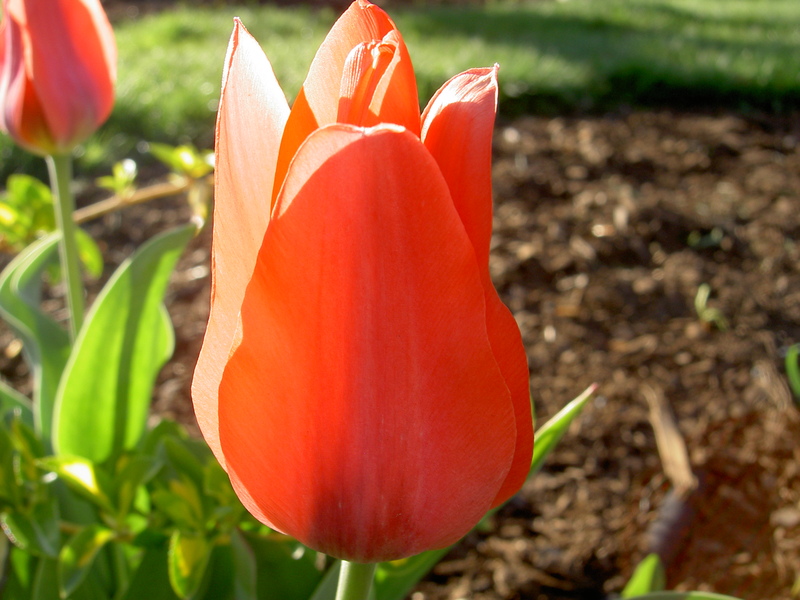 Love these tulips. I watered the bean pot (you know, pot full of bean seeds and a trellis just waiting to support them) and then headed to the backyard. 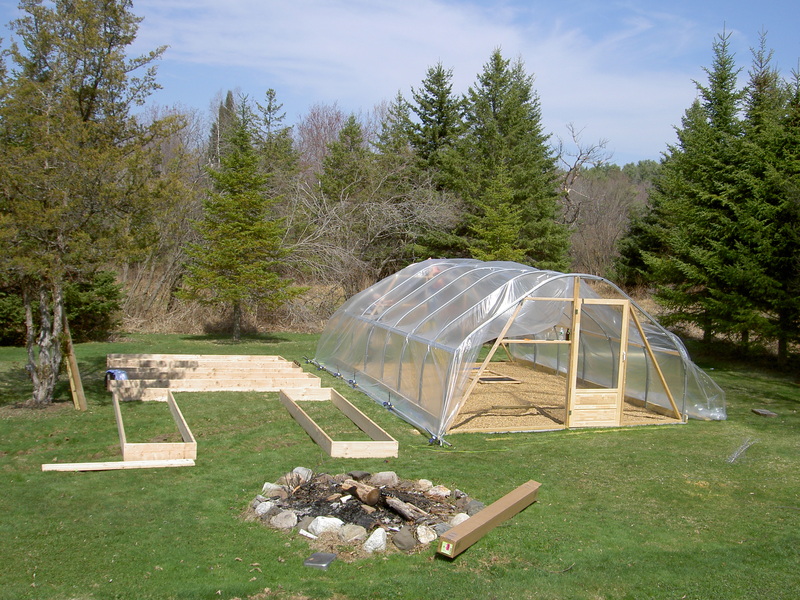 There, the mound of screened topsoil (4 cubic yards – more like a small mountain!) and the empty raised beds Keith built just looked at me. You see, they weren’t in close proximity to each other. The delivery guy couldn’t go into our yard very far to dump the soil due to the wet weather we had been having. If he went very far, he might not have been able to get out of the mud. The first one (dirt) had to get into the second one (planter beds) somehow. That somehow was us. Again, since we are basically weekend warriors, the soil pile just sat there during the week, getting rained on. So, I grabbed the shovel and started loading. It has only been a month since gall bladder surgery and I was warned, “No heavy lifting for 6 weeks!” so at first, when talking about Mt. Dirt Everest, the plan was that I would load the wheelbarrel while Keith finished building the supports in the garden beds, and then I’d call him over to bring the wheelbarrow to the beds, then I’d unload with the shovel. But he was inside and I was in Putter-mode, so I figured I’d start small – little 1/2 wheelbarrows. Fill with the shovel, bring the wheelbarrow to the garden bed, unload with the shovel. I did this a few times and then got the guts to lift the wheelbarrow to dump the soil into the bed. No pain, no ripped stitches or anything. Let’s go. Muck, muck, muck, shovel, shovel, shovel, LIFT!, muck, muck, muck, HEAVE HO! Rinse and repeat. After 5 of these trips, Keith came outside and asked, “Whatcha been up to?” Puttering, my usual response. I went in, changed to tank top and shorts, (sassy look with mucks may I just tell you? ), put the hair up, bandana on and grabbed a bottle of water. As he drilled in the braces on the rest of the beds, I continued my attack on Mt. Dirt Everest. Every once in a while, we’d say something to each other, but it was mostly quiet work. He asked me if I thought I’d finish filling the beds today. “That’s the goal – it is supposed to rain tomorrow,” was my response. When he finished, he grabbed a shovel and helped. We took turns. The loads I carried were 1/2 to 3/4 full and his were full. We took a few breaks during the day, heading inside for some water, choosing to skip lunch. It was good, satisfying team work. Once, I did hit his shovel with my shovel, sending shockwaves and a stab of pain into his shoulder for which I felt horrible and apologized profusely, but mostly, we worked in silence, tackling this togethergoal with determination. You know, like farmers who have to get the soil moved before a rainstorm turns it to mud? Like that. It has become a ritual for us to finish up a particularly tough day of yard work at Margarita’s. I call it the “Board Room” because it seems all our planning happens over a glass of their Original on the rocks. When we got home around 6:30, it was time for a nap. A full day of yard work and sunshine with 2 margaritas for dessert made me just want to lie down. So much for napping, I woke up this morning at 7 and feel sore as hell. Really sore as hell. I snuggled up to Keith and asked how he was. Sore as hell. I told him how great I thought yesterday was – we worked really hard, got a lot done, worked side by side, and ended the day with a nice time at the bar. The only way to get the soreness out of your muscles is to use them, so I was back, mucking and puttering by 7:15. Now, to tackle those weeds and the rest of Mt. Bark Mulch before the rain comes.